For girls who want long hair but are forced to keep it short, split ends can be a real problem. If you have always imagined having undulating waves to the small of your back, obviously you will have to accept defeat if you are currently sporting a crop. 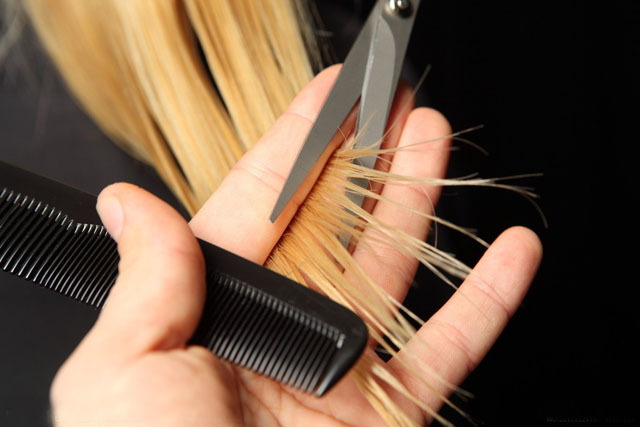 Hair grows at an rate of 1 cm per month, and making the classic mistake of scrapping regular trims won’t help. Split ends will keep on splitting up the half shaft and look awful. The only permanent remedy Is cutting them off. This cream-based conditioning treatment is designed to work on the hair in much the same way as facial moisturiser works on the skin. Once the cream has been spread evenly through the hair, heat is applied, in the form of hot towels or a dryer, to open the hair shaft and allow the conditioning agents to penetrate the hair shift fully. Tailor-made to tackle your specific hair problems, this treatment often incorporates a scalp and shoulder massage. This helps increase the blood flow (and therefore the delivery of nutrients) to the hair shaft, as well as relieving stress, a serious contributor to dull hair. Ideal for those who have seriously abused their hair, this liquid form protein-based moisturiser in designed to give a boost to weak, damaged hair. Your hairdresser may suggest a series of these treatments, as the effects are cumulative, For best results, a glossing conditioner is applied at the final stage.